Who could ever foresee that a simple phone call from a Mom and Dad inviting their son and daughter-in-law out to surf some waves would become a tradition that would spread around the world and bring much-needed help to those battling cancer? Surfing Santas in Cocoa Beach, Florida has become a local and international tradition that everyone should support and enjoy. “In 2009, I called my son George and his wife and told them to dress up like Santa and we’d all go surfing. The local newspaper took a photo and it was featured in the Christmas day paper. Then the next year several friends wanted to join us so there were nineteen. Then the next year it jumped to eighty-four and each year the surfers increased. Last year, there were over three hundred!” founder George Trosset told us. That’s right! On Christmas Eve 2014, three hundred Surfing Santas, eighteen Skydiving Santas and more than four thousand spectators participated! “Many different Christmas costumes were worn. Last year was the first year the activity took place in downtown Cocoa Beach due to the lack of parking and overall space further south at our home,” Trossett said. Not only is this a fun-filled, holiday event, it benefits two very good causes. “We support the Florida Surf Museum and the Grind for Life Cancer Fund. We have a friend involved in the Grind for Life as a cancer survivor and felt like that was a great benefit,” Trosset explained. “Since moving to downtown Cocoa Beach and seeing the growth and also seeing other Florida Beach communities starting their own Surfing Santas, it's my hope is that it will continue to grow and become a great charity benefit. Several countries have also started their own version of Surfing Santa's which all started by our family in 2009,” Trosset said. 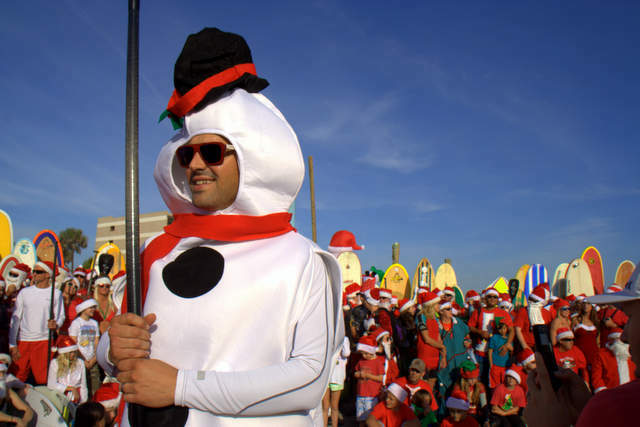 If you’d like to take part in this wonderful and zany holiday tradition, Surfing Santas 2015 will be held on December 24 at 8:00 a.m. EST at the end of Minuteman Causeway in Cocoa Beach, Florida. Photography by Thomas Routzong and Steven Skelley.